Fringe ‘O’ Saurus Rex roars into Old Strathcona from Aug. 16 to 26. The 37th instalment of Edmonton’s Fringe Theatre Festival is the largest in North America and features a record number of shows — 226 — showcasing more than 1,600 performances. Although the festival is the biggest and one of the oldest, the artistic director still believes the festival is about taking chances. “Anything can actually happen. Anything!” exclaims Murray Utas. Thousands of people will hit the Fringe site, at 10330 84th Ave., to wander around, take in an outdoor busking performance, pop into the beer tent and enjoy a food truck snack. But Utas believes you need to step inside one of the 38 venues to soak in the full experience. 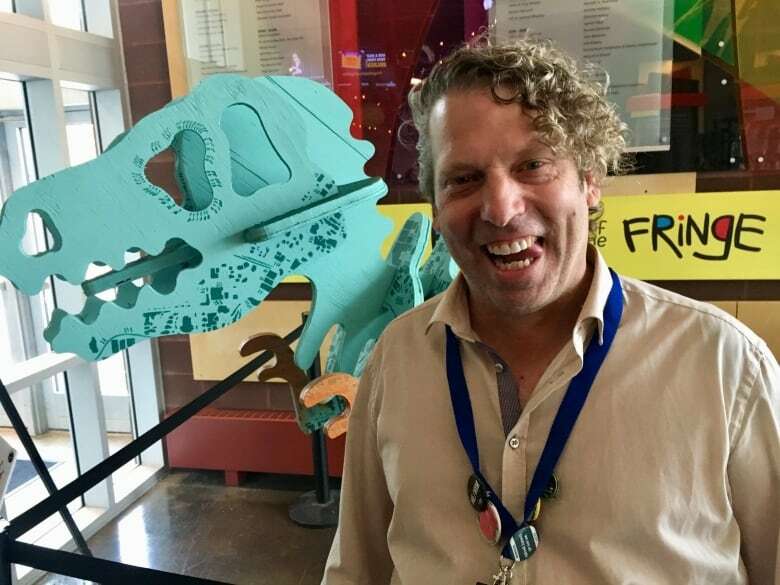 Fringe artistic director Murray Utas overseeing the Fringe ‘O’ Saurus Rex edition of the festival. (Adrienne Lamb/CBC)​ Utas admits choosing a play is like rolling the dice but the investment is an average of 13 bucks. When it comes to wading through the sea of offerings, here are Our Edmonton’s Fast Fringe preview snippets to help you. You can see more from the fringe on Our Edmonton with Adrienne Lamb Saturday at 10 a.m., Sunday at noon and Monday at 11 a.m on CBC TV. Venue 2: Backstage Theatre, 10330 84th Ave.
Venue 18: Sugar Swing Ballroom, 10019 80th Ave.
Venue 25: Strathcona High School, 10450 72nd Ave.
Venue 36: La Cité Auditorium, 8627 91st St.
Venue 8: Old Strathcona Performing Arts Centre, 8426 Gateway Blvd. Venue 3: Walterdale Theatre, 10322 83rd Ave.
Venue 10: Acacia Hall, 10433 83rd Ave.
Venue 4: Academy at King Edward, 8525 101st St.
Venue 28: The Playhouse, 10033 80th Ave.
Venue 30: St. Basil’s Cultural Centre, 10819 71st Ave.
Venue 9: Telus Phone Museum, 10437 83rd Ave.